Posted June 23, 2009 by Norburn Lighting and Bath Centre & filed under Bathroom Accessories, Kitchen & Bath Plumbing, New Products, Trends . 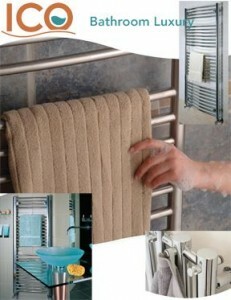 All Tuzio towel warmers are manufactured from materials of the finest quality and include a 5-year warranty. Almost every style is available for either hydronic (hot water), electric plug-in, or electric hard wireinstallation. All electric models are fluid-filled and run at 110V using a heating element (1-year warranty) with an internally programmed thermostat and safety cut-out switch for maximum safety and comfort. All hardwired models are now supplied including a digital timer featuring 7-day programming and a manual on-off switch. Choose from our wide range of styles and finishes to find the products which best complement your home.